Real New Yorkers don’t go to Times Square. We avoid its chaotic, tourist-filled streets at all costs. However, some of us might make an exception now that it contains a new art exhibit—featuring virtual reality elements and a 60-foot physical installation—dedicated to climate change. Launched Wednesday, the exhibit titled “Wake” and “Unmoored,” was born from artist Mel Chin’s vision. His work often touches on environmental issues, be it the Flint water crisis or ocean conservation. “All Over the Place,” a riveting and contemplative exhibit of his, is currently on display at the Queens Museum in New York City until August 12. That gives viewers a taste of the unconventional media Chin is unafraid to use. His work is bold—and his latest piece in Times Square is no different. 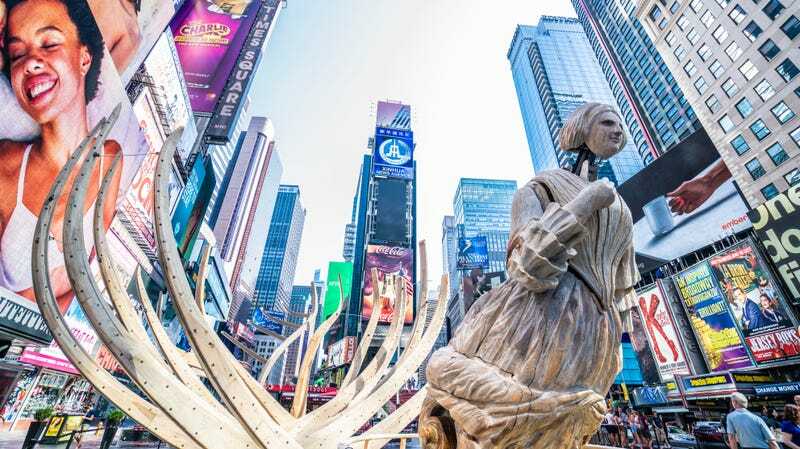 Anyone walking through Times Square can check out “Wake,” the towering wooden piece. It’s a shipwreck that features the skeletal remains of a large marine mammal resembling a whale alongside 21-foot tall female sculpture. This robot-like object is inspired by an opera singer’s figurehead that was once mounted on the USS Nightingale, a 19th century slave ship that could once be found in the waters surrounding New York City. Through this piece, viewers are reminded of the city’s past. “Wake” also serves as a natural transition into “Unmoored,” its virtual reality component that throws participants into a bleak future where humanity has lost the battle against climate change. This future is one where the waters have risen, where boats are floating through Time Square, and sea creatures are swimming near what’s currently dry ground. “It’s an opportunity to have ideas float above you,” Chin told the Thomson Reuters Foundation. This reality isn’t too far off, after all. Water levels may shoot up by as much as six feet come 2100, according to a 2015 city report. Rising sea levels will also cause more flooding. Times Square is more inland than other regions of the city, so this specific scenario might not play out that soon in Manhattan’s bustling heart. However, one thing climate change has taught us is to prepare for the unexpected. Wake and Unmoored will be viewable in Times Square until September 5th.